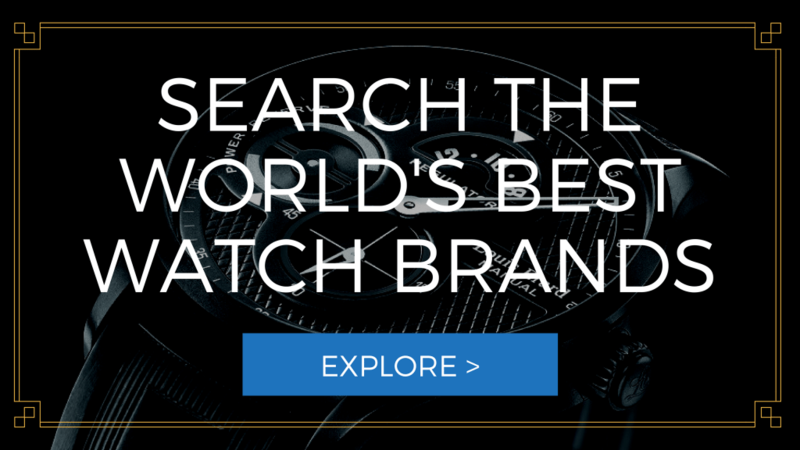 Gracious Watch features Citizen as the second best overall brand in all of the watch industry. Citizen is based in Tokyo, Japan and is one of the biggest producers of watches. It invented eco-drive watches that feature batteries charged by solar power, and atomic timekeeping watches that can synchronize with radio clocks in Europe, Japan and North America. When you buy a Citizen watch, you’re buying a watch based quality and dependability no matter what your price range. 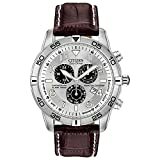 For more on Citizen watches check out the 7 Best Selling and Most Popular Citizen Watches For Men. When it comes to style and beauty, the brand is never left behind. They always develop high end timepieces at reasonable prices. This Eco-Drive release is another masterpiece that you should highly consider to buy. It has a black textured dial with luminous silver-toned hands and markers. Its case and strap is in stainless steel. The strap is also textured which contributed to its overall sophisticated look. 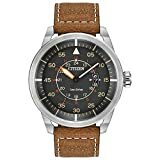 If you are looking for a watch that you can rely on at the same time affordable, you are looking right at the best one. This dress watch is absolutely for keeps. The brand always improve their products to fit to the current needs and wants of the constantly changing market behavior. 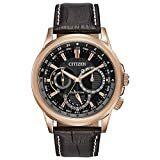 This timepiece is the ideal manifestation that Citizen is built for the maximum satiation of the customers. What buyers of this model love most is the fact that it has a plain yet striking look. Not to mention its luminous accents and sub sweep second hand. Its case and textured strap is in stainless steel. This one also has a sub-dial featuring 60 seconds function. You can use this timepiece in any events whether indoor or outdoor. This is also water resistant up to 165 feet. This rectangular watch carries with it the classiness that every watch of it’s caliber bears. It is a dress watch brushed with silver-tone stainless steel case and strap. Its case and dial is textured and it has a dial window positioned at 3 o’clock. The strap also comes with safety closure fold over clasp. This would make a beautiful and reliable watch for day to day use. You will not have to worry with water splashing or submersion because this is water resistant up to 99 feet. Given its quality and style, this is truly worth your hundred bucks. This is the type of watch that does not go out of style. As mentioned, the classic never go out of style. This model has the one of a kind façade. You will fall in love with this one at first glance. This timepiece will blow you away with its lushness. You will surely make an impression wearing this in formal or corporate settings. Its two-toned dial and strap is perfectly placed. Its hour markers are accentuated with stones to top up its overall peg. It also has a day and date function and its case and strap is made of stainless steel material. And it is water resistant up to 50 meters. If what you are looking for is watch that has the functions you need for the outdoors, this is one of the pieces that you should consider. It looks and feels sturdy and lasting. This is designed to cater the specifications that heavy duty watch users are seeking for. 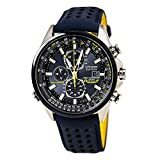 It is a chronograph watch with tachymeter, dual time, alarm mode, luminous accents, and perpetual calendar features. This is perfect to use for sports and adventure. It is also water resistant up to 100 meters suitable for swimming and snorkeling. “Sporty, casual, and trendy!” This perfectly describe this black “Axiom”. 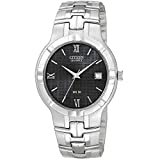 It is a round bezel watch plotted with Citizen logo at 12 o’clock. Its strap is very durable being made of leather calfskin material secured with buckle closure. It is powered with Japanese Quartz movement and has a date window at 3 o’clock. This is one of the best-selling of the Eco-Drive collection by the brand. It is loaded with functions and features that any type of men will possibly look for. Its black and gold toned dial displays chronograph features and multi-functional sub-dials. It has day and date plus world time features. Its leather calfskin has a deployant-clasp and push button closure. Designed to survive the extremities of the outdoors, this one is also 100 meters water resistant. This is the type of watch that every man should have in his closet. It is sporty and casual that makes you stand out. It has a look that is like no other. It possesses a rustic yet presentable look that adventurous type of men will adore. In terms of functionality, you can trust this one. It has date window, 24 hours, and 12 hours inner dials. You can also use this while swimming and snorkeling up to water depth of 100 meters. Its leather calfskin band is tested and proven to be durable. Every man will vie for this Eco-Drive Japanese Quartz timepiece. It has the features and functions fitted for indoor and outdoor events. Its royal blue dial and textured band gave it a very grandeur exterior. It possesses a very manly aura which made it one of the top-sellers. Its dial displays 24 hour, 60 second, 60 minutes, and date window. It is also water resistant up to 330 feet. Just by how it looks, this is the watch that will absolutely meet the qualifications that you are looking for in a timekeeping device. It has a textured rose gold case. It has chronograph functions featuring 12/24 hour time, 1/20 second time, alarm, world time, alarm, and date display features. Its textured croco-embossed leather band is also guaranteed of high quality. The band is also secured with buckle closure. If you are looking for a watch that you can go on for decades, you will not regret this one. This exquisitely designed laidback and manly timepiece is every man’s must have. You will surely impress yourself and your colleagues with this dress watch. It has the beauty and functionality at its best. It is solar powered and is part of the famous Eco-Drive collection. Its mineral crystal glass is made of scratch resistant sapphire. It features world time function which is a huge factor for those who travels a lot. It also has three sub dials showing 60 seconds, 1/100th seconds, and 24 hours plus a date window at 4 o’clock. This timepiece is the type that shouts a statement. It looks very fancy and lavish. You will surely stand out wearing this watch. A man deserves this absolute beauty. Aside from its irresistible charm, it is also multi-functional. It is part of the Eco-Drive collection thus you will be free from the hassle of timely battery replacement. It has a tachymeter and a chronograph function. It also has day and date data displays. This is the watch for those who are after comfort and style. It looks easy on the eyes which is perfect for sports and outdoor use. Inspired by sports and adventure, this is built to withstand any type of adventures. It is very comfortable to wear. This also stands out in terms of functionality and accuracy. 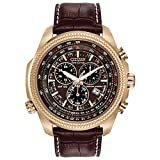 It is one of the top rated aviation timepieces you can find in the market. It features atomic timekeeping thus guaranteed to be the most precise in a global aspect. Featuring impeccable accuracy and precision, this Navihawk release is the prime Eco-Drive Chronograph watch. Its limitless features and functions are beyond compare. It is powered by atomic timekeeping that justifies its precision. It features precise time data in 43 cities. It also has 1/100 seconds, perpetual calendar, 2 alarms, countdown timer, backlight display, and pilot rotating slide rule functions. This round titanium brushed watch features a black sandwich dial with silver-toned hands and markers. It has a regal look that stands out. It is also light powered thus no need to have the batteries changed. The bracelet is titanium which explains its front-line quality. It featured world atomic timekeeping. It also displays date and day. This pilot watch soars high in the sky. It has three dials that fit the data demands of its users. The brand never fails to innovate and adapt to the current technological advancement and this model is one of the proof that they are one of the industry’s best. This watch is not only accurate but is very comfortable to wear. It is looks and feels very sturdy because it is made of titanium material. Its satellite timekeeping system will never disappoint you. Inspired by water adventure, this is a must have for all water sport lovers. 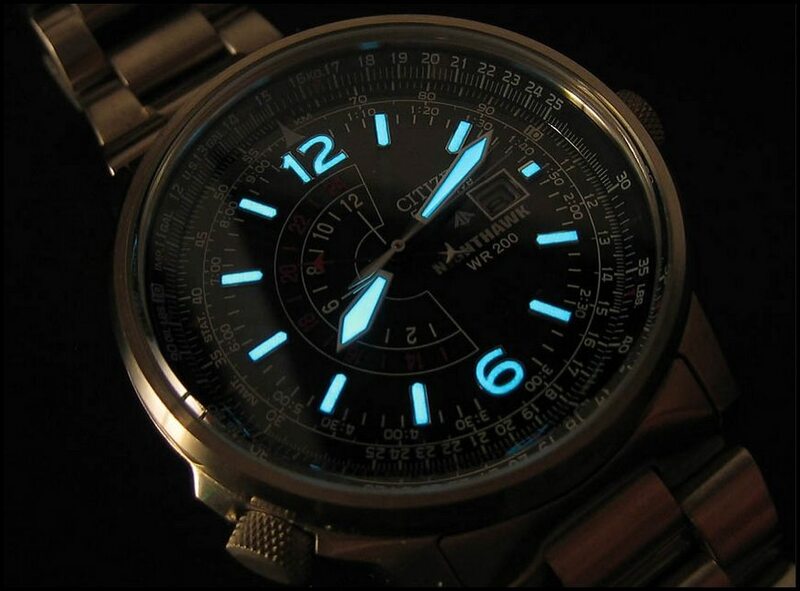 Its case is stainless steel featuring luminous hands, markers, and indices. It is very suitable for any kind of water sports such as snorkeling and recreational scuba diving. It has water depth measurement and a date display positioned at 3 o’clock. This can resist water submersion up to 200 meters. The Signature collection is a series of luxurious and multi-functional timepieces that Citizen is sensationally proud of. This collection is condescending in any country in the globe because of its unequivocal beauty. Aside from beauty, this is also multi-functional. It features ¼ seconds, perpetual calendar, alarm, timer, and world time features. Vintage looking watches are very trendy. Despite the era, they are always a closet essential. This vintage pegged timepiece is very stunning. Its dial is uniquely detailed. This has 4 sub-dials that feature 12 hours, 24 hours, 60 seconds, and day and date data. Despite its very dressy façade, it is water resistant up to 200 meters.